Form: A prostrate subshrub, mat-like or mounded. Leaf retention: Evergreen in mild winters. Growth rate: Slow to rapid, depending on cultivar. Mature Size: 2-8" high and 12-18" wide. Flowers: Small, usually clustered, purple, pink, red or white, edible. Fruit: A dry seed capsule. Leaves: Small, green, smooth or fuzzy, aromatic when crushed. Several thyme cultivars, such as Caraway, Lime, and Mint, have a fragrance, but no cooked flavor. Only two cultivars have a flavor that survives cooking, and are listed below. Stems: Herbaceous stems, growing from a woody base, become woody with age on some cultivars. Their stems will grow roots where their leaf nodes touch moist soil. Thymus vulgaris: thyme - the traditional culinary herb. Thymus citriodorus: lemon thyme - lemon flavor. Thymus 'Orange': an orange flavor when used raw. There are several cultivars with Orange in their name, some possibly better than others. Wildlife: Attracts bees and possibly butterflies. USDA hardiness zones: 4-11 for most cultivars. They may die to the ground in hard freezes and recover in late winter. Heat tolerant: Thymes suffer above 85°F and will need part shade and extra water. Thymus citriodorus, Lemon Thyme, is considered more heat tolerant. Sun: Full sun. It withstands part shade early morning or late afternoon. Water after becoming established: Monthly in cool months, once or twice a week in hot months. The soil must dry out between waterings. Soil: Well drained, dry, low to moderate in organic content, pH 6.6-8.5 (neutral to alkaline). These plants are subject to root rot in moist, poorly draining soil. Planting: It can be grown in containers. Prune: After the danger of the last freeze is past, shear close to the ground to rejuvenate and remove any remaining winter damage. After two years, the flavor diminishes and it should be pulled up and a new plant started from cuttings. Litter: Low except when the plant dies to the ground in hard freezes. Uses: An edible culinary herb. The flowers can be added to salads for color and visual appeal. 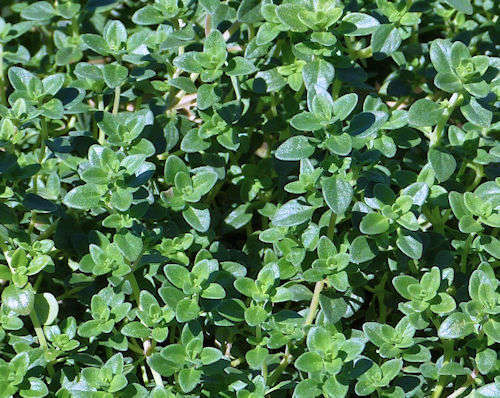 Thyme species are members of the Mint family (Lamiaceae). Most thyme cultivars have been developed as outdoor ornamentals, do not survive in hot desert regions, and do not have a good cooking flavor.